Links to published information used in writing the preceding pages are listed here. For each source listed, a key exerpt is also given. 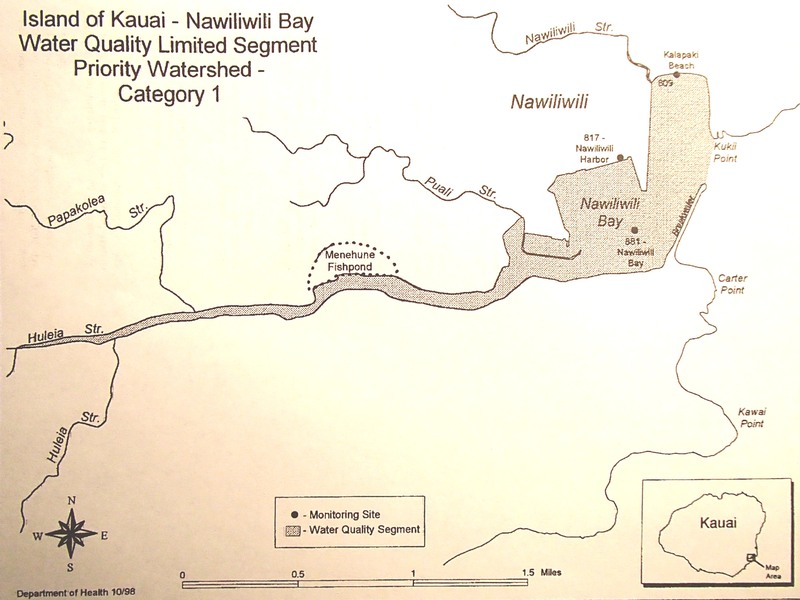 This excellent educational web site has been our primer, our first source of knowledge about the place of Nawiliwili Bay and Hulē‘ia River, about ainakumuwai and the Island of Kaua‘i, about our home. “Invasive plant and animal species pose a threat to not only all of Hawai‘i’s watersheds and water resources, but also the tourism-based economy, agriculture, health, and quality of life. Habitat destruction and the introduction of alien species have been the predominant cause of biodiversity loss in Hawai‘i for over a century. More native species have been eliminated from Hawai‘i than anywhere else in the United States (KISC, 2003). Native species comprise only a small portion of the species composition in the Nawiliwili Watershed. This area is named Nawiliwili because at one time native wiliwili trees were abundant. Now, less than a handful of these trees have been identified in the watershed. Non-native and invasive vines trees, shrubs and grasses are instead the dominant populations. On a tour led by one of the local kayak companies on the Hulē‘ia River, a single plant (moa) and a single wiliwili tree were pointed out as the only native species in the area. developing cross-programmatic and community partnerships to enhance wetland and watershed habitats. Aurai, i’m “hooked up” to malama huleia…cheeee! Finally, a large out-pouring and efforts of all involved. Debra, who is the group working west of the fishpond? Mālama Hulē‘ia has already been in contact with the Okada family and hopes to continue a dialogue with them. All groups wanting to volunteer should check out our How to Help page. Nice respond in return of this issue with real arguments and explaining everything about that.